Luchador! 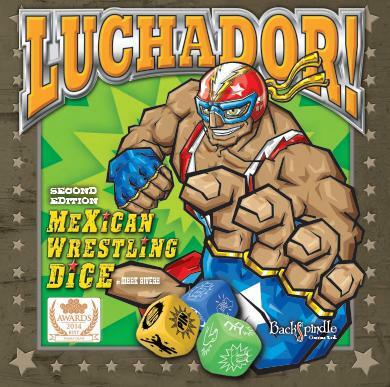 Mexican Wrestling Dice game. A award winning fantastic fun family game. Play with your friends and family. Take on the role of being a Luchador Wrestler without actually hurting anyone. Throw those dice, but be sure to keep them in the wrestling ring. Join up to make Tag-Teams. High-five to tag in and out of the ring. Cheer as you Pin your opponent to the floor. Do your trademark special moves and combos. And if all else fails, go for the big KO finish. You can win by KNOCK-OUT (KO) – If you opponent’s Strength Score is reduced to zero (marked as KO on the Strength Score cards) or lower, their Luchador (wrestler) no longer has the strength to continue the bout and you win by a Knock-out. or win by a PIN – When a player rolls a successful Pin result (using a Pin Die) and their opponent fails to break the Pin during the 3 Count Rule, the pinning player is declared the winner. 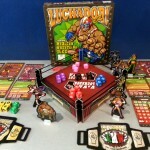 Luchador is a Fast-Rolling, Hard-Hitting, Body-Slamming, Neck-Crunching, Chair-Smashing, Table-Slapping dice game for 2 or 4 players. Luchador! Mexican Wrestling Dice game was released at Spiel, Essen 2013 in conjunction with www.weegamers.eu The first and second editions sold out with a month of their release. Viva Luchador!